Ben Smith: Professional footballer. Recognise the name? Of course you don’t. That’s because most of Smith’s years in the game were spent outside the vaunted, big-money environs of the Premier League — and this sporting memoir is all the more entertaining as a result. 1995: an adolescent Ben arrives at the training ground of one of England’s biggest clubs to begin his journey and realise his dream of playing top-flight professional football. Aged just sixteen, he shares pre-season sessions at Arsenal with the likes of Dennis Bergkamp and Ian Wright. Surely this is the start of a stellar career? Instead, the next seventeen years saw the bright young star descend the ranks from Highbury to obscurity. With seasons playing for the likes of Reading, Yeovil, Southend, Hereford, Shrewsbury and Weymouth — and a career including three promotions, one relegation and some very memorable FA Cup games — Ben’s story is one of a quintessential journeyman footballer. Candidly describing the negotiations, insecurities, injuries, relocations, personal implications and wet Saturday afternoons playing in front of 500 people, Journeyman offers a unique insight into the unvarnished life of a lower-league player — so far removed from the stories of pampered Premiership stars — as well as documenting the many teammates, opponents, managers and coaches who left an indelible mark on Ben’s eclectic career. Refreshingly unsentimental and often hilarious, Smith’s story is essential reading for all true fans of the not-always-so-beautiful game. Put down the latest predictable ghost written life story of a pampered Premier League star for this eye opening chronicle. 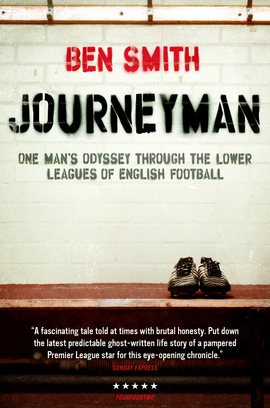 5/5 The playmaker lifts the lid on lower-league life at Hereford, Crawley and beyond.